Idealism is, as we all know, an inherent character trait that you can neither learn nor unlearn. In other words: You either have it or you don't. MAD MAX musicians Michael Voss (vocals/guitar), Jürgen Breforth (guitar), Axel Kruse (drums) and Thomas "Hutch" Bauer (bass) doubtlessly have that unshakable idealism that ensures that the band still delivers optimum performance even after 35 years, without ever giving in to supposed restrictions dictated by the music industry. 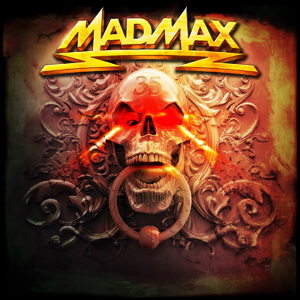 In the case of the current MAD MAX album, 35, which reflects musically and thematically the development of the group since it was founded back in the early 1980s, there can be no doubt that they still haved lots of strong ideas up their sleeve. What is more: The new album sounds both classic and contemporary, holds lots of surprises in store and - last but not least - pays homage to the four band members' heroes. 35 was produced at the Kidroom Studios in Greven, the drums were recorded under the direction of Rolf Munkes (CREMATORY, PHANTOM 5) at his Empire Studios in Bensheim near Frankfurt, and the album was mastered at CS Mastering in Bratislava by Christoph ´Doc` Stickel (MICHAEL SCHENKER FEST), so the production parameters live up to the album's high compositional standard. 35 will be released as CD DigiPak version, limited vinyl version, download and stream on August 10th 2018 through SPV/Steamhammer.